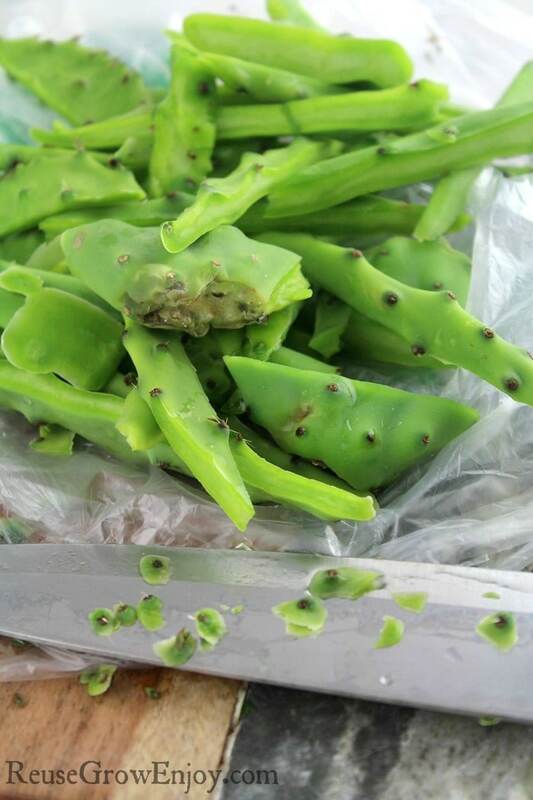 Have you ever eaten cactus nopales? That is the flat part of the prickly pear cactus plant also called the pads. You would be surprised at how good they really are! I had it for the first time a few months ago at a cookout in a cactus salad. 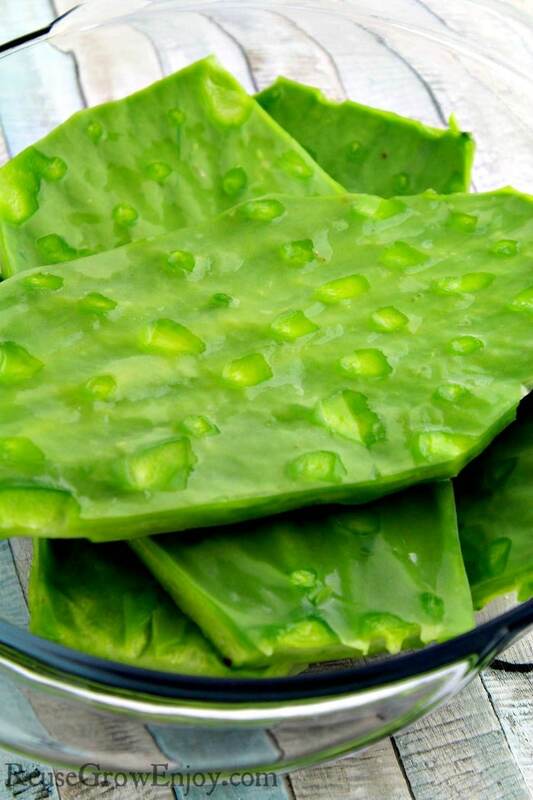 I never even knew that you could eat cactus nopales before then! Anyways after that, I had to look it up and see how you could cook with a plant like this. I wanted to know so that I could make that salad because it was oh so good. Anyways, I figured you may want to know too. 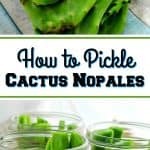 I am going to show you how to pickle cactus nopales. Now first thing is to find the pads (nopales) in the store. Not every store will have them as they are not something everyone cooks with. If you can’t find them in your local grocery store, check your local Mexican market and you should find them there. One thing to note. When working with cactus pads, you may want to wear some gloves to do the first step. They do have sharp points that will hurt if they poke you. You will also need 3 wide mouth pint canning jars to store it in when you are finished. Put your gloves on before you start. Now grab a sharp knife and cut the edges of the paddles off as well as the base. Then rinse under cold water. You will see some slime so don’t be alarmed, that is normal. Just be sure to run it under cold water for a few seconds to rinse most off as some do not care for the slime. Next, lay the paddle flat and take a knife or vegetable peeler over the prickles to remove them. Some may be thicker than others and have to be cut out and not just scrapped off. After you have them all removed, run it under cold water again. Now you want to place the clean and rinsed paddles into a glass bowl. Generously dump sea salt over them and allow to sit for about an hour. The salt will help to reduce even more of the slime. Then you will want to give them yet another rinse in cold water to remove the salt. Then cut the paddles into strips. Much like you would cut a potato for a french fry. Then rinse them again and boil them in water for eight minutes. Drain them, rinse them and then pat them dry with a kitchen towel. Now they are ready to be placed into the brine and be pickled following the recipe below. 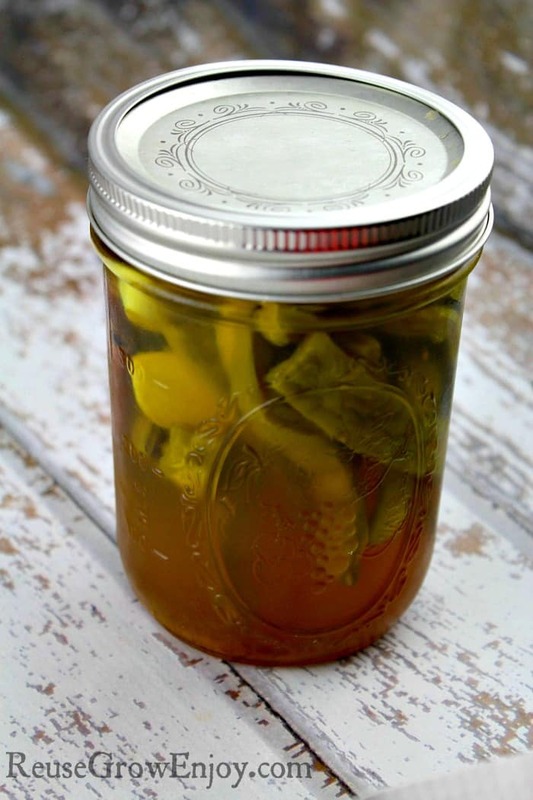 If you like pickling recipes, here are a few others to try. 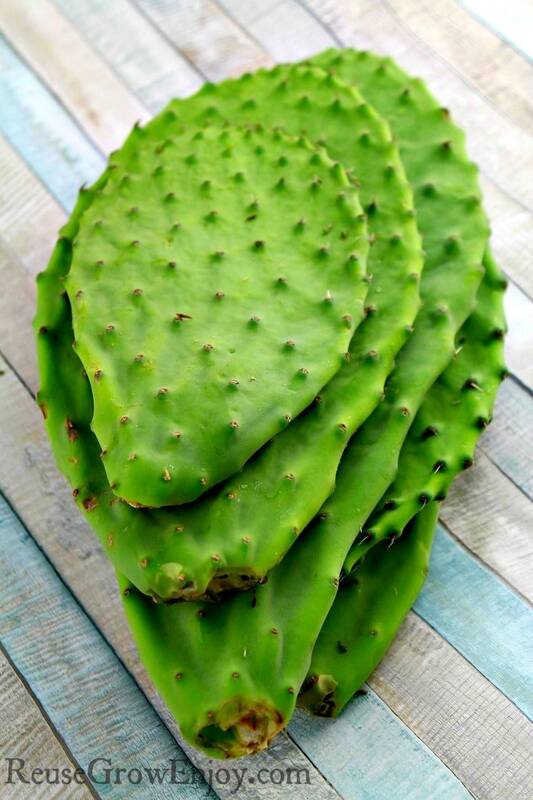 Pickle cactus nopales is a great way to add a boost of flavor to just about any dish. Toss in a salad or eat on their own. Combine honey, vinegar, turmeric, sugar, 1 cinnamon stick and salt into a small saucepan. Bring the mixture to a boil and then reduce heat and allow to simmer for five minutes. Be sure to stir frequently. While that is simmering, get 3-pint canning jars with wide mouth ready. 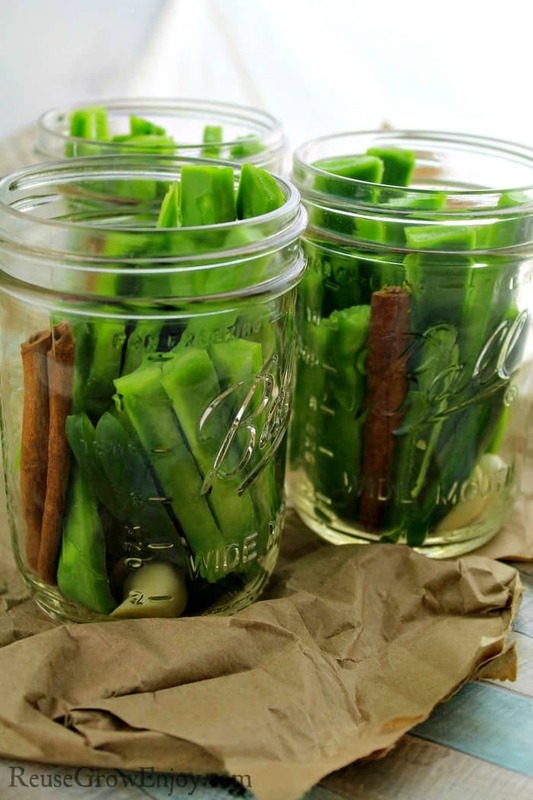 Pack each jar with 2 cloves garlic, 1-2 slices Jalapeno slices, 1 cinnamon stick, and cactus strips. After the brine is done simmering, pour it over each jar leaving about a half inch from the top. Try to make it even amount in each jar. If you do not have enough brine, use a little distilled water to top it off. Put the lids on the jars and allow to cool. Then refrigerate for up to 1 to 2 weeks. If keeping longer, can them in a water bath canner. I grow these and I put them in a strainer and scrub them with a vegetable brush to get the little stickers off before I do anything else with them. That is a great idea Cindy! Thanks for the tip!